Yet another several weeks have passed. At this point, we are almost at the end of the growing season for what I’ve planted. Over the past few weeks, I’ve spent countless hours in the garden picking green beans! There were two weekends where it took about an hour and a half each weekend to pick green beans. This past Friday, I picked another good helping – but maybe spent 45 minutes. 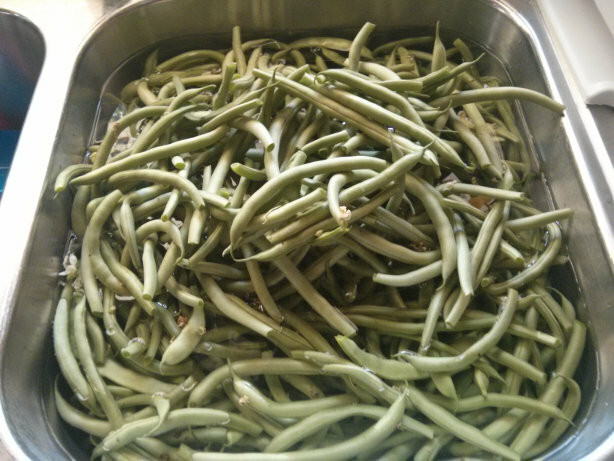 Then – after the green beans are picked, they all have to be snapped. There was another good hour and a half each time too! Overall, we now have seven gallon-sized bags of green beans in the freezer. I’ve also cooked some up to put in some dishes lately too. The green beans are just about ‘pooped out’ with the height of the pickings now done. I don’t have an updated picture of the front garden, but the tomato plants are really putting on a lot of tomatoes! Unfortunately…. there is a problem. Almost all of the tomatoes that have ripened so far have blossom end rot. The bottom of the tomatoes are rotted out. I did pick four or five tomatoes on Friday that had some rot, but was able to cut it out and use at least 3/4 of the tomato. Some of the others have been really bad and they were a loss. I’m wondering if it is because I put the green beans next to the tomatoes, which I’ve heard nitrogen can ‘seal up’ the calcium in the ground. And a calcium deficiency or improper watering is known to cause blossom end rot. I would like to think I’ve watered the plants regularly, so I don’t believe it is a watering problem. 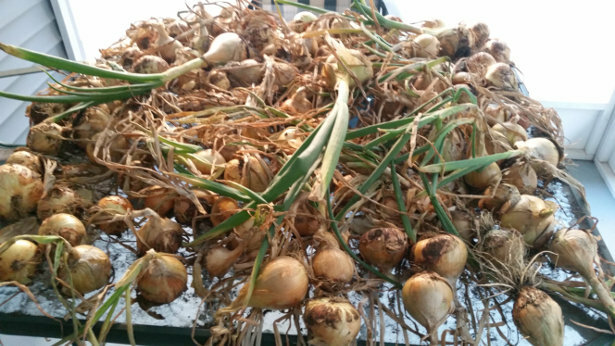 Onions – what a fantastic year for them. Almost every one of the onions were in good shape. In year’s past, at least half or more of the onions would be rotted out before they were even ready to harvest. Because of that, I planted a significant amount more to make up for it. Well, nature surprised me by having plenty of onions! The Walla Walla onion variety seems to do well – but I think it is also because they were planted in the raised bed on the driveway. 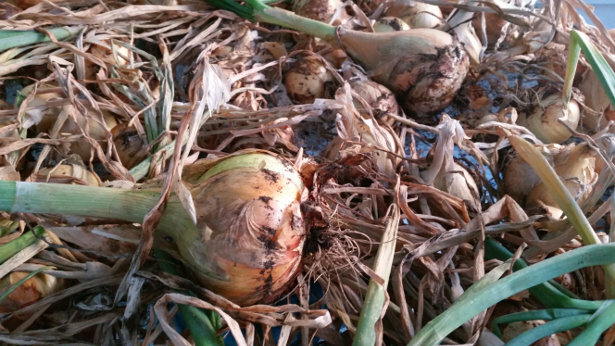 I did plant a few of the onions in the front garden – and some of those did rot. The entire patio table is full of onions. The onions started getting picked about four weeks ago and the last of them were picked this weekend. They still didn’t have the tops drooped over, but I didn’t want them to rot so they got pulled. There were two really huge, good-sized onions. The rest were about ‘average’ size of a few ounces each. And lastly… I got myself into a job yesterday (Sunday). The raised beds are now quite a few years old. When I made them, I cheapened up on the wood that was used and purchased one-inch thick pieces. Well, being in wet soil all the time, they were rotting out. So the bed on the driveway needed some work. This time, I purchased a 4×4 that was eight foot tall – and it was chopped into 10 inch sections to be used around the four corners of the bed to provide a good fastening joint. 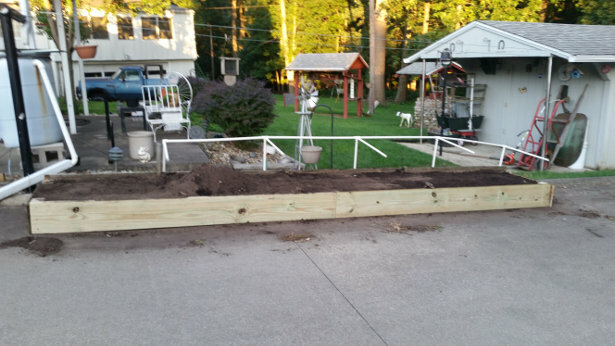 Two 2×10 boards that were eight foot long were purchased to repair the front side of the garden bed. The original bed was 12 inches tall – so I am losing a little bit of depth. But just those three boards were about $30 for pressure treated lumber! Cedar is way too expensive to make it worthwhile. About three hours in the hot sun and the work was done. At least when I took the old boards off, the majority of the dirt stayed in it’s same position and didn’t cave in. I still had to remove some dirt for the new 4×4 posts in the corner. I still need to get the PVC pieces back on but otherwise it is ready for next year. The opposite side of the planter will need replaced soon too, maybe next year. Matthew, the owner of Team Mamo Realty, has had us create several websites for him this year! After getting the other sites done, he said it would be great to have one website that would be used to showcase each of the properties he manages for vacation rentals. He came up with the name of Family Time Vacation Condos. The website is very simple – a one page landing page with a picture of each unit that he manages with a link to the specific page on the appropriate website. It allows him to provide one website address to any client looking for a vacation rental and see the selections offered. 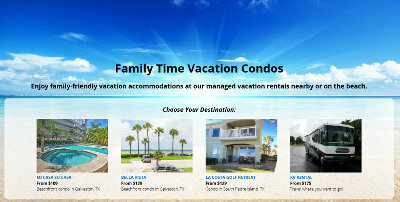 The website is at familytimevacationcondos.com. Matthew, the owner of Team Mamo Realty, asked us a couple months ago to create another vacation rental website for one of his new clients. 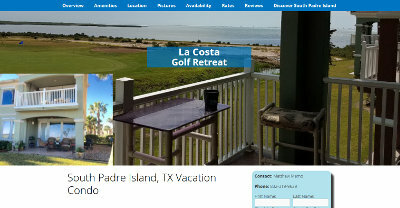 His new client has a vacation rental in both Galveston, TX and also in South Padre Island, TX. The vacation rental websites he has had us create in the past only had one unit on them, so this site was slightly different. The opening or ‘landing’ page has a picture of each unit along with their review rating and starting price. When clicked on, it takes you to that specific listing with the details for the unit. Matthew approved of the website this week and it is now open! The website for My Family Condo is at myfamilycondo.com. Tony, the owner of Greenville Transportation, contacted us asking for help. He wanted to move away from his current provider due to the excessive costs they were charging him, and he didn’t believe there wasn’t much of any benefit to stay with them. We helped Tony with website hosting services to get the site on our systems for a fraction of the cost. Tony notes that he has one other website that he may want to move over in the future and potentially a new website he’d like us to design. 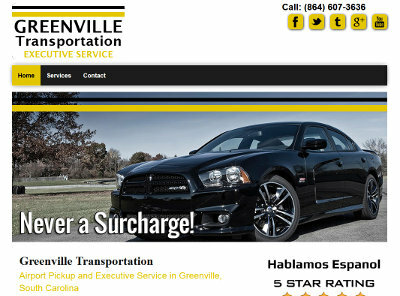 The website for Greenville Transportation is at greenvilletransportation.com. 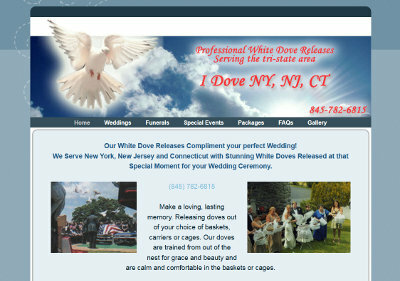 Vincent contacted us about a month ago needing help with a website for his business, I Dove New York.. He had a website in the past but had since lost contact with the web designer and found that his site was removed/suspended. Initially, Vincent wanted to just have a very simple website put back online because of his issues with several web designers in the past. He didn’t fully trust the fact that we would be here to support him for years based on his prior experiences. However, we were able to find his old website that was suspended and provided him a link to it to view the archived website. Once he saw that we were very knowledgeable and was able to uncover it, he asked us to re-create the website identical to the prior site. Once Vincent was ready to move forward, we got started on the website and it was completed in less than 48 hours after their initial payment. Vincent called us quickly thereafter and explained how impressed he was with our fast we were and how we pulled through with what we promised. He noted that he will be spreading the word about us because of how well they were treated and our professionalism. We appreciate the business and the kind words from Vincent! Their website is at idoveny.net. Dale, the owner of Molanda Company out of Central Illinois, contacted us last week needing help with his website. His website got hacked with postings of movies and other random advertisements and needed assistance getting it fixed. We looked at the website to determine the full scope of what needed to be fixed and got to work on the website quickly. We worked feverishly on Friday and Saturday to remove all of the bad material and content from the site. All of the ‘plugins’ along with the theme of the site were upgraded along with a new installation of the website to ensure nothing was left that could infiltrate the site. We look forward to helping Dale with his website needs going forward. 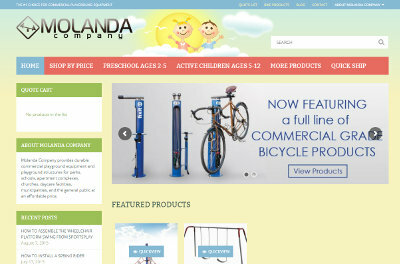 The Molanda Company website is at molandacompany.com.